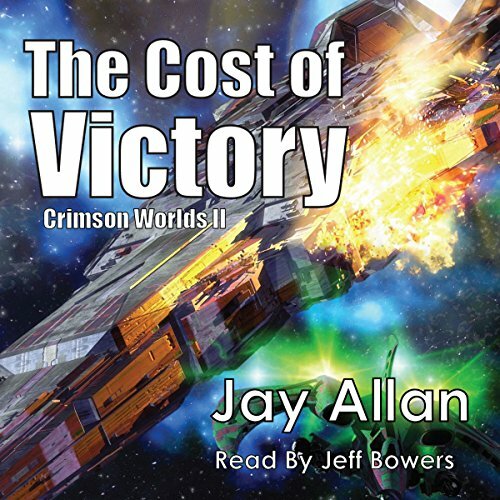 The Cost of Victory is the second book in the Crimson Worlds series and the sequel to Marines. Jay Allen writes a very compelling story of what could be called WWIII (he calls it the unification wars). Lots of of space battles and a very interesting outlook on what politics driving the battles may look like - with lots of speculation. This is fine as it gives the reader something to ponder. Lastly, Jeff Bower does a FANTASTIC job of narrating the books. A few sound effects tastefully added enhance the book. I wish in a series like this they would tell you if more books are coming and if so how many. Jay Allen puts in an addendum where he describes the superpowers, space battles in zero gravity -- and things like why a space fleet zipping by and making a firing pass at another fleet at high speeds may need hours to stop, turn around and come back and other such details. It is worth the money. I like Cain he reminds me of good commanders I knew in the corps. I downloaded the book at around 7pm and couldn't stand his narration of the audiobook. As well he doesn't seem to have a good range of voice differences for different characters. I liked the overall story line I wanted to try this book hoping the narration would be better but I have now decided to return the book and not get the rest of the series. If you’ve listened to books by Jay Allan before, how does this one compare? YES, IF YOU ENJOY SCI FI AND OR MILITARY ACTION, YOU WILL WANT TO READ ALL 6. What was one of the most memorable moments of The Cost of Victory? EVERY TIME ERIC GETS A PROMOTION OR MEDAL IS A LEAD IN FOR MORE TROUBLE. Which character – as performed by Jeff Bower – was your favorite? ALWAYS THE DEATH OF CHARACTERS WE ARE FAMILIAR WITH CAN CAUSE A DAMP EYE. I HAVE READ ALL SIX AND WIL ONLY REVIEW OR RATE A FEW. BUT THESE ARE ALL ATLEAST 4 STARS. JAY WRITE AS WELL AS IF NOT BETER THAN SOME BIGGER NAMES. I WANT TO ADD THANK YOU FOR REDUCING THE PRICE OF A KINDLE AND AUDIOBOOK SO A PERSON CAN AFFORD THEM. I AM A DISABLED FF PARAMEDIC ON SOC SEC NOW AND ALL I CAN DO WITH MY INJURY IS EXIST. BUT THESE NOVELS TAKE ME THERE AS IF I AM LIVING IT. I CAN FEEL ALL THE EMOTION AND EXPRESSION AS IF I M WATCHING A MOVIE. The story is awesome with lots of action and intrigue. I would definitely recommend this book to anyone looking for drama, action, suspense, and of course, Sci-Fi! What other book might you compare The Cost of Victory to and why? Lost Fleet - lots of space action and the reality of physics is not ignored. His delivery was weak and without emotion. Most of his voice were childish squeaky and without emotion. Absolutely not! It wasn't the story that was the problem it was Jeff Bowers! I want someone reading the book that can get some emotion showing and can do decent character voices. I will definitely look to see if he is doing any books I listen to in the future. I still like to actually read and I may just opt to read vs listen if he is narrating. Drop Jeff as a reader! I am not sure if this will happen in the following books... But a great deal of this book was spent retelling of the 1st book. Then towards the end, we start retelling information again! Then Were done! Did The Cost of Victory inspire you to do anything? Anyone who likes their main characters unstoppable and the enemies they face, pushovers. Horrible performance. The narrator was dull, no emotion, flat. If I wanted this type of performance I would have my computer read the book to me, it may actually do a better job. What character would you cut from The Cost of Victory? I would have rewritten the main character so he would have something resembling a personality. As it is, Cain is simply a 2D character with little depth. The characters are flat, the narration is dull, the story is predictable. The author needs to understand that if you make your character win every battle, it takes away the suspense. Flawless hero type characters who always commands his troops to victory is not only difficult to relate, it also makes the book predictable. The enemies the main character faces are a bunch of retarded monkeys, as if the Cain and his cohorts are the only ones capable of military tactics. I felt like I was being read to by a parent or grandparent or something. It was driving me crazy. I listened as far as I could and found I knew nothing about the story line. Have to close it and I'd buy it if Jay Allen changes his narrator. Checking every book I purchase.